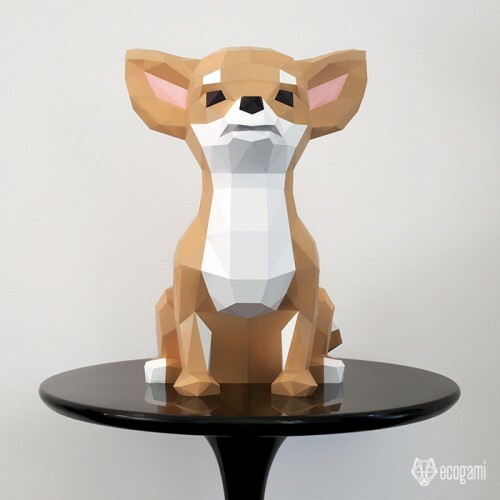 Make your own papercraft Chihuahua with our printable PDF template. It’s easy! Just follow the instructions & you will be proud of your faceted mini dog! Isn’t it a cute dog & an original decor for your sweet home? ► Once finished, you can customize the sculpture according to your taste and even make it like your real chihuahua. The customization options are infinite! You can color each face with felt-tip pens to make it multi-colors (I did it for several models). Or, you can paint it to make it stronger & easier to be cleaned. With an oil paint or even spray paint, it will look like laminated & your friends won’t believe you made it with paper! ► Difficulty Level: Medium. This model is easy to assemble. It has few small folds & cuts (in the mouth, ears and the nose) but nothing very difficult.